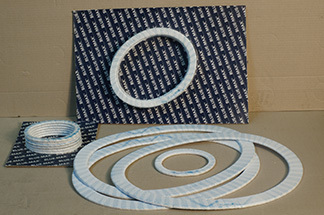 We stock Blue-Max® Boiler gaskets in the most often used sizes in both Hanhole & Manhole. Special sizes supplied as required. A Blue-Max® gasket is manufactured from a proprietary tacky cloth of glass, synthetic fibers, and brass wire, impregnated with a blue elastomer compound. The material is cut and formed to the desired size and shape, then coated with a proprietary Teflon material per MIL SPEC T-27730A. The finished gasket is easily installed, delivers trouble-free service, and does its part to reduce expensive boiler maintenance and downtime. Blue-Max® manhole and handhole gaskets are engineered to provide all the durability, resilience, and sealing properties of an asbestos gasket, but without the asbestos. Tests confirm that Blue-Max® gaskets seal on steam to 450psi and on cold water hydro tests up to 1500 psi, and withstand working temperatures to 500°F. Rubber gaskets simply can't take that kind of pressure and heat.